There are two new features today. That's a sign that we're working hard on Apollo. Read on! A few months ago we added the ability to add custom fields to contacts, so you could stop putting all data that didn't had a specific field in the “Background info” field. Starting today, you'll be able to control what users can put inside custom fields by specifying a set of predefined values for each field. 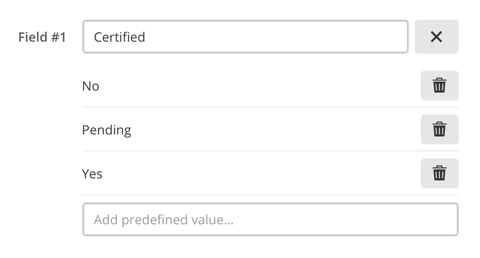 For example, a “Certified” field could only contain the values “No”, “Pending” or “Yes”, as seen below. Once you set the predefined values, fields in the contact form will stop being free input textboxes. Instead, they will be constrained to the specified values. Heavy calendar users rejoice! Apollo now attaches .ICS files containing event data to notification emails. This means that you can now add or update the specified event in your calendar app by simply opening the attached .ICS file. Some clients – like Apple Mail – can also do it automatically, without your intervention. This happens to every notification email related to calendar events, like when an event is created or changed, when you're invited to a meeting or when a person responds with its participation. After a tight battle, the last poll saw the Gantt Charts feature winning over the Task dependencies one 59% to 41%. We're working hard on Gantt Charts, and users from The Brave Collective are beta testing the feature right now. Meanwhile, we've released a new poll so you can continue voting for your favorite features. Overview: the Team overview table is now more precise; its calculations are based on all workspace projects rather than just projects accessible by the user currently logged in. The quick task entry box below every Task list now has the ability to set the priority: just prefix one, two or three exclamation marks before the task name to set respectively a low, medium or high priority. Uploading a file with a name longer than 70 chars wasn't being allowed. Duplicating a project or creating a project from a template containing a task with special chars would give an error. For some tasks, the comments icon would never turn off, even after reading the task comments. Welcome to the first update of 2018! While we're hard at work on big new features, we wanted to show you a couple smaller ones. Here we go! Avid Timer users will find this very useful. When saving a Timer connected to a Task, they often have the need to check the Task off their list. This usually involves remembering the task description after hitting Log time on the Time form, finding the task again and then marking it as completed. As a shortcut, now you can simply check Mark task as completed directly on the Time form. Once you hit Log Time, the timer will be saved and the task will be marked as completed in one fell swoop. For those that like to filter tasks by their context, there's a small enhancement. Projects, Contacts, Deals, etc. in the “Refine by” box are now sorted alphabetically rather than (seemingly) at random order. This should make easier to find what you're looking for. As mentioned in previous posts (see here and here), our plan was to introduce a new user interface and ditch the old one sometime in the future. Well, that time has arrived, so this is the last call. In the upcoming days, those that are still using the old theme will be automatically switched to the new, flat style user interface. That is all! Stay tuned for more in the upcoming weeks. Thanks for reading! Better unicode and multibyte support in data handling. Sometimes, calendar filters were not saved. API: time entries added weren't being rounded to the minute. Sometimes a user could receive multiple notifications for a repeating task (where one notification is enough). Welcome to the last update of 2017! It's been a great year for us, and we wanted to introduce a couple new features before it comes to an end. Let's give them a look! Up until today, the user permissions system in Apollo was very basic: it just provided a setting to grant the Administrator permission, which allowed a user to edit contents created by other users, create new projects and templates and manage them and, last but not least, manage users. Sometimes though, you might want to just offload some of your responsibilities to somebody else, without giving them too much power. For example, you might need a content moderator that is not allowed to manage projects or edit or delete users. Starting today, you'll have a granular permission system to choose from. Just open Settings → Internal users and set your preferences for each user. Can manage projects: let the user add projects and edit project settings and members. Can manage templates: let them add and edit project or task list templates. Can track contacts and leads: enable user to CRM features – such as Cases and Deals, and adding notes and tasks on contacts – instead of just the Contact list. Can export contacts: allows the user to export contact data as CSV. Can edit other users' stuff: allows the user to edit other users' content – such as messages, tasks, comments, etc. – in projects it can access. Can manage users: let the user invite new users, disable them, delete them or set their permissions. Can change Apollo plan and credit card info: this is self-explanatory. Can see reports: enable the Reports section for the user. 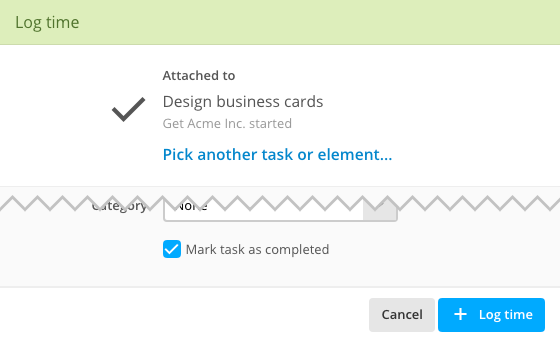 This is a much requested feature by CRM users working on a team. Deals can accumulate quickly, and sometimes they get added twice. Merging them is the only way to declutter without losing any data. To merge a deal, just open it, click the Options button, click Merge deal and follow the onscreen instructions. That's all for today, and for 2017. Merry Christmas and Happy New Year from all of us at Apollo HQ! Ability to set a “per day” value on Deals. Better initial rendering for Tasks. The timers panel wasn't dragging correctly in Firefox. The date for recurring Tasks could be removed using the Task quick date dropdown. Some task list on the project's Tasks page weren't being hidden when unchecked from the list on the right pane. Merging two projects would sometimes skip some files. Starting a project from a template wouldn't create the template's file folders. Tasks presets weren't storing the grouping setting correctly. All-day events added from Apollo mobile app weren't showing in the full app. Welcome to a new Apollo update! Once again, we're announcing the availability of a feature that recently won one of our polls. The polls are proving very useful to prioritize our work and we're grateful that you took the time to cast your vote. To enhance the Contact management part of Apollo and cater to a wider audience across different industries, today we're unveiling the ability to add custom fields to your Contacts. If you found yourselves pouring contact data – that hadn't a place in one of the available fields – inside the generic "Background info" field, rejoice! You can now create custom fields as needed; just open the Custom CRM fields page inside Apollo's Settings to setup the fields' names. After that, the Contact form will show an additional section containing all your custom fields. They will also be shown on the right pane of the Contact detail screen. Custom fields are also available in the search-by-field area of the contact list, and just like the standard fields, they can be used to filter the list. Custom fields are available on all plans, and the number of fields you can create depends on your specific plan. Keep in mind that this is the first iteration of a new feature, with deeper integration coming in the future. As always, feel free to send your feedback to contact@applicomhq.com. Better handling of the task responsible field when the ability to assign a task to multiple responsible for a project is switched on or off. Added work cell, work direct and home cell to the allowed types for the Phone field in Contacts. Improved the app loading time by a tiny bit. The Industry filter wasn't working when exporting contacts in CSV. Due to a timezone issue, the total logged time in the overview was wrong sometimes. Some contact tasks were showing the link to the related note even if there wasn't one. The email dropbox functionality allowed to create a task without a responsible. In our last post, we introduced the new Timers, which brought a flat user interface, keyboard support and more. Unfortunately, they've had a bumpy start; we found a bug related to timezones, which we fixed the next day and pushed it for everybody to use. Save a Timer, or edit its time and/or the description without expanding the Timer itself. View and open the attached Task, Project, etc. when the Timer is collapsed and there isn't a description set. Detach any Task, Project, Contact, Case or Deal attached to at Timer. Also, the Timer creation date, which was shown in a tooltip in the previous Timers but gone in the redesign, is now back and visible at the very end of the expanded Timer. Some users were also worried that the Timer description didn't default anymore to the name of the task the Timer was started on, so we brought back that as well. Whether you cast your vote for the last poll or not, use your points to vote today! New points are awarded every Monday (if you missed the announcement, you can find it here). That's all for today. Remember that all of this couldn't be possible without your feedback, so keep it coming, we love it! Task descriptions containing long words (like URLs) are now wrapped to multiple lines. Added the resize handle to the Rich Text editor widget – it only works in Chrome and Safari right now, sorry. Mobile: added folder management to the project's Files section. Mobile: the file uploader in the project Files section wasn't working. Sometimes, uploading a file would get the upload button stuck. In some cases, a task assigned to multiple responsibles couldn't be completed. Changing the due date using the task's inline date dropdown would remove the start date. The image annotation dialog wouldn't always show a multipage PDF as such. Our streak of new features originated from feature polls is taking a pause, just for today, because there's something that needs its own moment: the new Timers. The Timers functionality is a tent-pole in Apollo, and it's available since day one. Over time, we added the ability to adjust them on the fly and to see the Task, Project or Contact they were connected to, but lately they've been sort of neglected. Also, their appearance looked out of place in Apollo's flat style user interface. It was time to start from scratch, and that's what we did. Let's see what's new! Gradients and unnecessary graphic elements are gone, while buttons and important informations are bigger and much easier to understand. 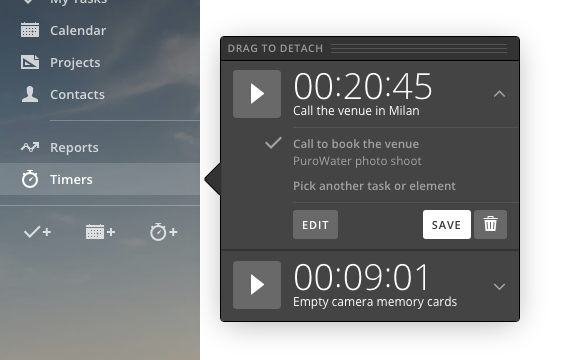 Secondary actions and informations – like the element a Timer is attached to – are initially hidden but one-click away. The running Timer (not pictured here) has now a much more prominent look, so you won't have any trouble finding it even with tens of Timers on the list. 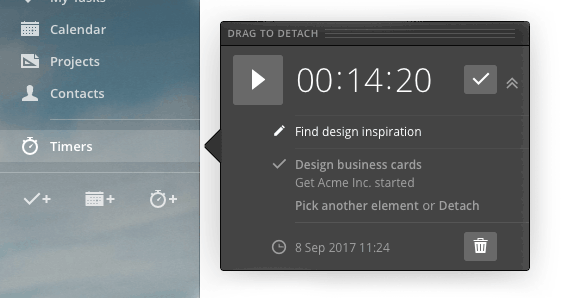 Previousy, you could attach a Timer to a Task, Project, Contact, Case or Deal when saving it, or you could start the Timer directly on a Task and have it preselected when saving it. Now you can pick or change the element attached to the Timer anytime, even if the Timer itself is running. This is also useful if you started the Timer on the wrong Task, or if you'd like to attach the Timer to the Project as a whole rather than to a specific Task. Selecting a Task in the previous Save Time dialog window was an exercise in frustration; the Task picker was small, uncomfortable and limited. That's now massively improved, thanks to your feedback and to the new Task picker window. This window will be shown whenever you need to attach a Timer to a Task, a Project, Contact, Case or Deal, and brings multiple improvements over the old Task picker, such as the ability to filter Tasks by description, to search for Projects, Contacts, Case and Deals, and to create a new Task instead of selecting an existing one. All of this while the Timer is still running. You can now use your keyboard to navigate the Timers panel. This includes play and pause the Timer, expand and collapse the detail area, edit the time amount, description, attached Task or element, or save the Timer. It's a huge improvement, and it will be surely appreciated by advanced users out there. As you can see, changes are quite big for an initial release. We'd love to know your thoughts about the new Timers, so drop us a line at contact@applicomhq.com if you have some to share. We're in the middle of the summer break in Italy, but some of us are still working to bring you fresh features. Read below what was added to Apollo this week! After shipping the ability to assign a task to multiple responsibles, we got a lot of positive feedback from our users. Some of them though reported that, in some cases, having multiple responsibles is counterproductive, and wanted to enable the feature on a per-project basis. Well this is now possible! Just uncheck Allow multiple responsibles on tasks when creating a new project, or in your current project settings. Last year, we added the ability to select a specific person as a project manager. While it's great to assign a supervisor for a project, when checking tasks across all projects you couldn't easily identify the manager of the project they belonged to. In busy workspaces, being able to filter all open tasks by project manager can be a big help in identifying bottlenecks. So now you can do it. 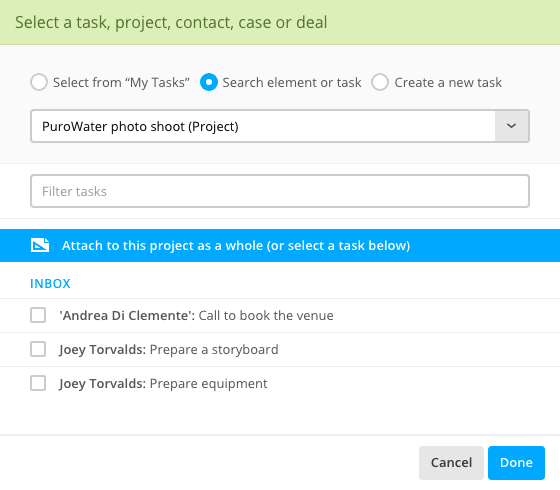 Just head to Tasks across all your projects and select the project responsible on the filters from the right. Up until today, project tasks and milestones were shown on the calendar with a gray background. Now you can choose a specific color for each project. Open the project settings and set your preferred color using the Calendar color option. Picking files from your preferred cloud storage services right from Apollo is beyond useful, but to upload files there you had to resort to their corresponding app, be it Dropbox, Google Drive or Microsoft OneDrive. Often though, other project users do not have access to the cloud storage accounts connected to your Apollo workspace. Starting today, you can upload files and let your collaborators do the same right within Apollo. This works for all supported cloud services. The CSV export file for Tasks now shows the completion date. Added a link to open the relative task in the “Top 10 delayed tasks” report. Tasks CSV export file wasn't showing all responsibles for that task. In some pages, checkboxes weren't showing the checkmark. The timers panel was being cut off by the tab bar. Due to a bug with multiple responsibles support, in some cases the overview wasn't showing the correct task count. Uploaded files weren't showing in the project feed anymore. Various fixes to the CSV import from Capsule. Since we started our first feature poll, user participation has been great! That's a sign that they care about the future of Apollo. Today, we're at the fifth poll already, and we're releasing the winning feature of the third poll: the ability to use folder and sub-folders in a project's Files section. Everyone whom has ever used a computer knows its way around folders and subfolders, so we don't think we need to explain how it works. You only need to know that, starting today, file management in Apollo takes a small leap forward: you can now organize your project files in a folders hierarchy, move a folder inside another one, rename it, and so on. You can even download the entire content of a folder, if you wish. A path bar is shown at the top portion in each screen, so you can easily go back to parent folders. And that's all for today. Remember that we have much more in the pipeline, and you can decide what will be the next feature by voting for your preferred one. Just head over to the Polls page. Tasks in their list form now show the start date, if set. Project time: after editing a time entry, the estimated time wasn't being shown anymore. The "New version" button in the file detail view wasn't working anymore. Sometimes, the Edit button in the project file list wasn't working. Overview: for some users, the refresh button for Project and Contact activity was stuck in a loading state.